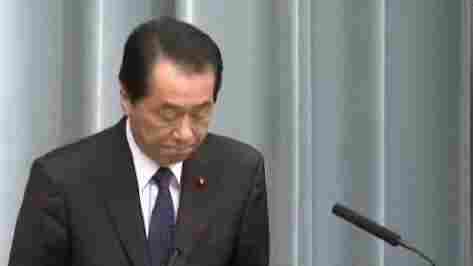 Japanese Prime Minister Gives Up His Salary : The Two-Way Naoto Kan said he will not accept his prime minister's salary until the crisis is over at the Fukushima Dai-Ichi nuclear power plant, which was crippled by a March 11 earthquake and tsunami. Japanese Prime Minister Naoto Kan said today that he is giving up his $20,200 a month salary "until the crisis at the Fukushima nuclear power plant is brought under control," Kyodo News reports. There is video of the prime minister (with English translation) making that announcement during a news conference earlier today. Kan also said Japan is scrapping plans for new nuclear power plants and will "start from scratch" on its energy policy. Also today, "92 members of 54 households from Kawauchi Village" were allowed to briefly visit their homes, which are within the evacuation zone around the Fukushima Dai-Ichi power plant, which was crippled by the March 11 earthquake and tsunami. "The evacuees, aged from 21 to 85, put on protective clothing and received dosimeters and walkie-talkies at a gymnasium before entering the zone in 5 groups by bus. During the visits, they collected valuables and checked on livestock. They then returned to the gymnasium and underwent radiation checks."